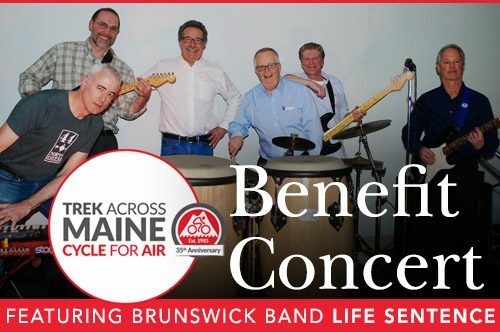 The Trek Across Maine Benefit Concert is a fundraiser to support Mid Coast–Parkview Health’s 2019 Trek Across Maine team. The Trek Across Maine is an annual multi-day cycling event benefitting the American Lung Association, and for the first time this year, its new route will begin and end in Brunswick. The concert will feature live music by Brunswick band Life Sentence. Life Sentence members include current and former Mid Coast–Parkview Health physicians Irl Rosner, MD, Scott Mills, MD, John Parker, MD, Nick Hyde, MD, and Bill Stamey, MD, along with Randy Shaw. Guests will also enjoy light appetizers provided by Frontier. General admission $20; tickets available on explorefrontier.com.